An art project to honor the sacrifice of the fallen soldiers of Operation Iraqi Freedom. Here we are, back at it! 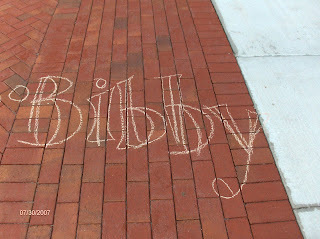 Today, I picked up some chalk, and printed out a list and we're on our way downtown. If you want to join us... any help is awesome! We'll get there somewhere around four, today, and probably leave around six! We'll also be picking up where we leave off today, tomorrow. If you want to join us at Centennial Park, December 9 @ 4:00! It looks like I'm into the swing of things, here, with school, and we'll be back at the chalk this weekend! Yesterday afternoon I was recognized for a Do the Right Thing Award, which was pretty nice. 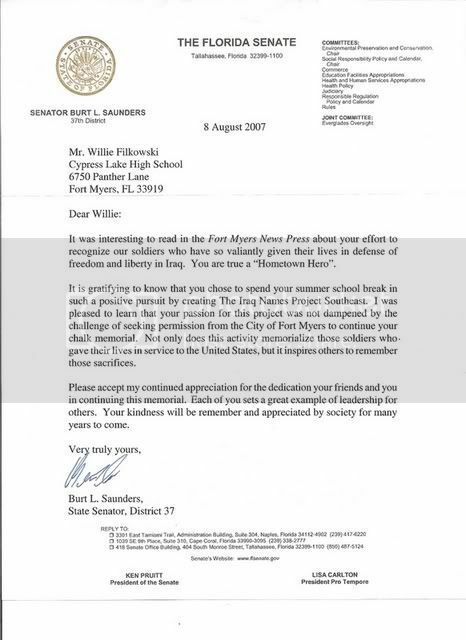 Today I went to my school to get some things worked out with my schedule, and when I went to my counselor's office, I had some mail from Florida State Senator Bert Saunders. This is the letter he wrote.. I will keep you posted of infor for chalking tomorrow. But, as for the week, as far as I can tell, we won't be chalking. School is just starting back up and I want to make sure I've got everything taken care of for the first week. We're not going to be out there on Friday, but Saturday and Sunday you should see us down there. We don't know what time, yet, but we'll put it up here! Thanks for all of the help this week.. Thanks to Christie, Mom, Annie, Keith, Harriet, and Mike! Thanks to all of you who have helped, written letters, or are going to help! And thanks to Mike Flanders for helping me out, and helping get the project back on it's feet! I'll stop posting with who's saying what about the project for now.. We succeeded, and I'll give it a rest with showing all of the publicity. It's all as positive as it can be from now on! On the front page of the News-Press again! It's not as huge as the last time, but I made it on the front again! This time they're talking about how we WON with city council and got the job done. Listen to AM 940 this morning, at 8:00, they're going to have me on! Our meeting with Councilman Mike Flanders, and City Engineer Saeed Kazemi went so well! We have an arial map of downtown, with Xs on the patches of sidewalk we can't use. 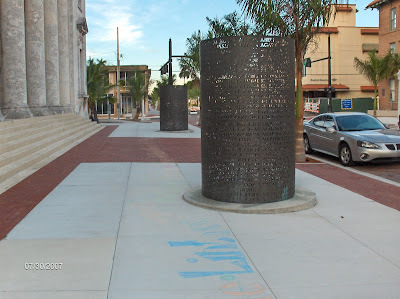 Due to construction in the city, and contracting stuff going on, the City of Ft. Myers doesn't technically own all of the sidewalks in the city. Yet. So, they gave me a map of the parts that they do own, and told me to go ahead. They are in full support of the project and appreciate what I am doing. We will be in contact so that I can find out when the city will finally own some of the roads and sidewalks, which they will grant permission for us to continue. As for now, we will start again in Centennial Park, and continue with where we left off. We will use as much of Centennial Park's sidewalks as we can, and then most likely continue on down Edwards Drive. The City, Mike Flanders, and Saeed Kazemi are going to write me an 'official' letter that I will carry, that permits me to continue with the project on the sidewalks owned by the city.. They are also calling the Police Department to tell them that I have been given permission to continue on city owned property. The fact of the matter is, I was mostly on 'privately owned' property. The city stopped me, because, although they like the project, they can't let me continue. Thank you all for your support, and I hope to see all of you out there tomorrow night, at 6:00 in Centennial Park. If you could all come out, that would be great. Show your support, and help chalk some names in! Here are some words from my friend, Nancy, who has been helping this project out a lot. I asked her to write something for me to post, since I figure people might get annoyed, or bored with listening to me blab all of the time..
As soon as I heard about the Iraq Names Project, I knew that I should help. I was so glad that Willie adopted the idea that the people in Portland had. and he ended up giving it to a homeless person. will have with the city. Nancy Hendrix, Ph.D.
We'll be sure to keep everyone posted and let you all know how the meeting with Councilman Flanders goes, and if we need to attend the City Council meeting. Did anyone catch today's Editorial Cartoon in the News-Press? The Instant Editorial in the News-Press has done a re-cap of the message board online, here. Maybe you can leave a comment, or check out what's up! The Miami Herald also picked up the story here. It's the same story as most of them, but, it's very cool that people from all over are taking an interest and showing the story to everyone. I apologize that the blog has been looking boring, recently, and that we don't have any pictures. It's mostly been text, and no fun with pictures.. since we have nothing to take pictures of. Some coverage in the Charlotte Sun, newspaper. Maybe take a look here? It looks like there are just a few forms we have to fill out in order to get our permit, as soon as tuesday, says my friend over at ABC-7. If you didn't catch the story, read it here. Maybe they'll post a video sometime tonight of the story that ran, which was really great. We confronted Al Abdo, acting city manager, on Friday night about the project. He said Filkowski now has the green light to start chalking again. "We certainly support what he's doing and encourage him to continue," said Abdo. "We admire and commend him. He's a model for all young people." Filkowski heard the news for the first time on Friday night. "That's good news, really good news," said Filkowski. But Filkowski says he still plans to meet with the Fort Myers City Council on Monday. City leaders say all the teen needs to do is fill out some paperwork and he can start chalking again. That could be as early as Tuesday. I'll look for the phone numbers I need, and get on it tomorrow morning, if the appropriate offices are open! I'll let you know as soon as I have any more information! On the WINK TV website, they have a video of the news story they did on me, and the story that have that was written by the AP. Yes, the AP, the national news wire. I just got home from our interview with ABC-7, who is going to run the story tonight at 11:00. Once the light was on, I was miked, and the camera was rolling, they told me we have a victory on our hands. The interim City Manager said to Stephanie that he's been trying to get a hold of me all week, and that he has the power to grant a permit, and that he will do so! I think it's a victory, and I can't wait to have it physically in my hands.. then I know it's real, and that our 'hiatus' is over. Is the permit even a physical document? Alright, watch the news.. and we'll see what's up. Every reporter I talk to knows more than I do.. jeeze! Thanks for all of the coverage, though. Something you might want to check out.. The News-Press sometime during the day today, did an 'Instant Editorial' that they posted online, and left open for discussion in the forums. You read the editorial, and see the forum (or even leave a comment of your own) here. And you can check out another forum someone started about the project here. It's pretty simple to register in order to put your two cents in.